The new Piazza Building will include a large lecture theatre with about 350 seats, although we’ll be discussing exactly which seats to use in the new year (as ever, suggestions welcome via learning-spaces@york.ac.uk). The tablet chairs as shown below are only indicative - there will be a writing bench similar to our other high quality theatres. At this month’s Working Group, we discussed power provision (a socket per every three or four seats, similar to Spring Lane) and technology provision. The height adjustable lectern that we introduced in Spring Lane has been well received, so will be repeated. However, we’ll be moving it away from the seats a little, so that it sits about halfway between them and the projection screens. We’ll also be shrinking the lectern from the three metres wide in Spring Lane to closer to two metres in Piazza to help make sure that there’ll still be plenty of free space at the front of the theatre. We’ll be pairing the lectern with another video flipchart table which, like in Spring Lane, will allow the use of the projection screens (two, about the same size as Spring Lane) instead of traditional whiteboards. Working seamlessly with lecture capture, as well as providing more virtual writing space than we’d have been able to fit had we used traditional column boards, the video flipchat has received overwhelmingly positive feedback so far - though we will be looking at making it a little more presentable in its next incarnation! As well as taking the best bits of our recent builds and refurbishments, we’re always looking for ways to improve our spaces. 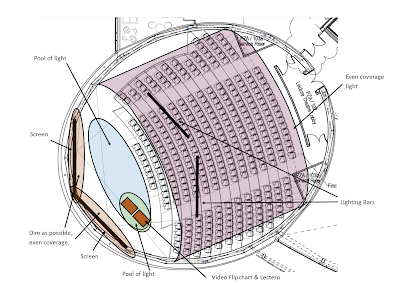 One of the things we’re looking at for the Piazza Building is the lecture theatre lighting. As well as the standard strip lights that we find in lecture theatre across campus, we’d like to include some more focused lighting towards the front of the theatre. 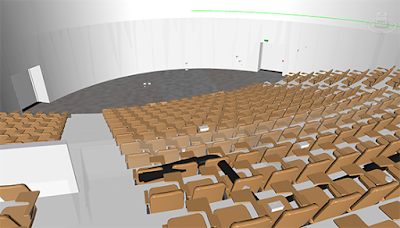 This will help to create a ‘performance space’ at the front of the theatre, as well as making the projections look better and simultaneously making the speaker is easier to see. Speaking of performance spaces, next time will be a look at a potential societies space within the Piazza Building.